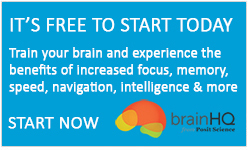 We have partnered with Posit Science because their product, BrainHQ, has been proven to improve brain fitness and health. 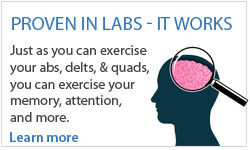 This is, in fact, what matters the most and the reason both DynamicBrain and Posit Science are so thrilled that leading researchers from all over the world have tested (and continue testing to this day) our BrainHQ technologies and Brain Fitness Exercises. The results of these rigourous clinical tests have been published in science journals and demonstrate incredible benefits for brain speed, memory, the overall quality of one’s life, and even improvements to personal safety. 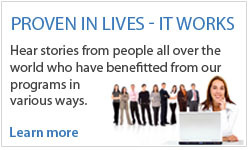 Many of these studies and the researchers who have been involved are outlined below. Speed of processing training protects self-rated health in older adults: enduring effects observed in the multi-site ACTIVE randomized controlled trial. Transfer of a speed of processing intervention to near and far cognitive functions. Speed-of-processing and driving simulator training result in improved driving performance. The impact of speed of processing training on cognitive and everyday functions. The ACTIVE cognitive training interventions and the onset of and recovery from suspected clinical depression. Exploratory study of incident vehicle crashes among older drivers. Relation of useful field of view and other screening tests to on-road driving performance. Cumulative meta-analysis of the relationship between useful field of view and driving performance in older adults: current and future implications. Predictors of driving exposure and avoidance in a field study of older drivers from the state of Maryland. Age and visual search: expanding the useful field of view. Computer-Based Therapy for Mild Cognitive Impairment: results from a pilot randomized, controlled trial. Brain Fitness in Parkinson's Disease. The influence of perceptual training on working memory in older adults. Brain-Plasticity-Based Cognitive Training in Cancer Survivors with Self-Reported Memory Impairment. Useful field of view after traumatic brain injury. UFOV performance and driving ability following traumatic brain injury. Brain Fitness for Improved Quality of Life in Chronic Heart Failure. Cognitive Training for Post-Traumatic Stress Disorder (PTSD). Improving Cognitive Speed of Processing in Adults Aging with HIV. The ACTIVE cognitive training trial and predicted medical expenditures. A cognitive training and Brain Fitness program based on principles of brain plasticity: results from the Improvement in Memory with Plasticity-based Adaptive Cognitive Training (IMPACT) study.